Diabetes-related scams are one of the top health-related scams on the Internet. Unfortunately, thousands of diabetics have been taken advantage of by charlatans and others who offer solutions that sound too good to be true (and, they are!). There are thousands of diabetes books, ebooks and supplements on the Internet that promise to cure your diabetes in 30 days or less. Be careful! These programs are designed to take your money and run and hide; and, they provide no support or follow-up after you buy their product. Concerning curing your diabetes in 30 days or less, if you understand the science and pathology of Type 2 diabetes, then, you realize that you can't cure diabetes in 30 days or less! It takes a minimum of 120 days to turn over your red blood cells, which have been glycated and damaged by the diabetes! A lot of clients who bought one of those programs were very upset because the program didn't work, plus, no one responded to their questions once they paid their money for the book, ebook or supplement. 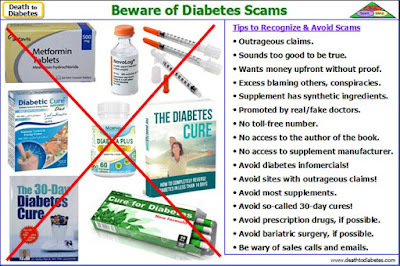 There are many diabetes scams out there that promise the world but they don't deliver. In addition, these scamming websites won't allow you to try their product for free like Mr. McCulley does with his Death to Diabetes program. Why?? Because they know that diabetics would find out that their program doesn't work and they won't buy their book. Many diabetics are apprehensive and confused about all of the "cure diabetes" books, infomercials, and programs out there on the Internet and on TV. And, they have a right to be. 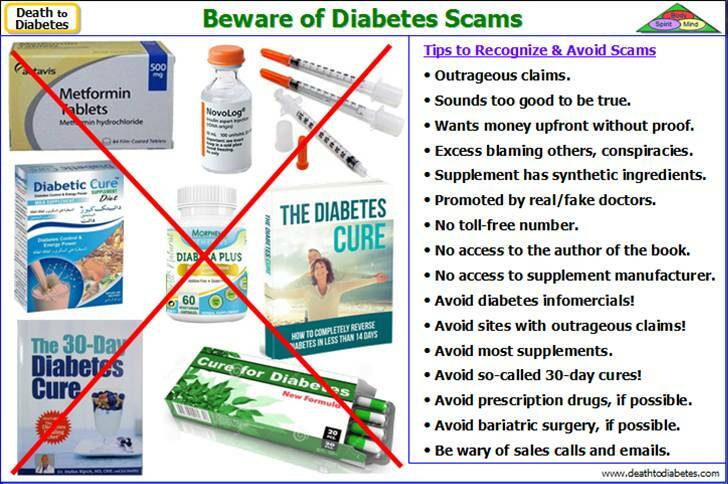 There are hundreds if not thousands of diabetes scams out there. If you have been victimized by a diabetes scam, you're not alone. Warning: Most of these "cure diabetes" programs on the Internet use the same formula. They show a picture of a doctor with a stethoscope around his neck, supporting this "miraculous" cure, based on so-called clinical research (that doesn't exist or is based on one small study). The website explains what diabetes is and how it's now an epidemic. They also provide hundreds of fake testimonials supporting their claim. But, they won't really explain their program in detail, and they keep pushing you to buy their book, supplement or other product. Once they get your money, they "disappear" -- that is, you can't get them to return your phone calls or answer any of your emails or provide any emotional support. But, it's too late because they got what they wanted -- your money. 1. There is a lot of information on the internet about so-called "diabetes cures". This creates a lot of confusion for many diabetics. Also, some diabetics lack the scientific knowledge about what diabetes really is -- it's more than a blood sugar problem! 2. Most of us trust and believe in our doctors when they tell us that there is no cure for diabetes and that drugs are your only answer. After all, they went to medical school! Note: Even the author believed his doctors when they told him he had no choice but take the insulin for the rest of his life if he wanted to stay alive.3. Many diabetics have tried other diabetes books, ebooks, programs, or infomercials on TV that just didn't work. These books and programs lacked the substance to really provide any authentic information to help diabetics with their disease. 4. Some diabetics have tried to fight their diabetes on their own, but they have been disappointed and unsuccessful when they changed their diet and exercise. They were unaware that they were still eating the wrong so-called healthy foods, and that they were exercising improperly. As a result, they became discouraged and anxious to buy any so-called "cure". 5. Many diabetics believe that there is a magic pill out there that will help them "cure" their diabetes. This is just not true -- there is no magic pill that cures diabetes. Once you read the author's view on diabetes, you will understand the science behind Type 2 diabetes and why a pill cannot beat this disease. At the same time, you will learn the strengths and weaknesses of this disease, and how to defeat the disease by focusing on its weaknesses. Payment required.Whether the proposed treatment requires you to buy a “natural” supplement or a book before you can get any more details about the alleged diabetes cure, be wary about Web sites or programs that pressure you to pay up front. Even if the program promises to repay your money after a trial period, view it with suspicion. No Toll-free Number or Contact Us. On their contact page, there is usually an email form but no email address or contact number. So basically, they have made it completely impossible for you to get in touch with them should you be dissatisfied with their service. This is a huge red flag and a tactic often employed by scammers to avoid complaints. But, even if there is a phone number and Contact Us page, call the number, and fill out the Contact Us form before you buy anything. Then, wait to see how long it takes for them to respond to your questions. But, make sure you ask tough questions that require a technical response. The product is a supplement. If there were such a supplement, you would have heard about it on the national news! Supplements do not contain what a diabetic's body needs to cure their disease. These supplements tend to contain vitamins, minerals, and herbs that most diabetics have already heard about, i.e. chromium, gymnema,, bitter melon, cinnamon, Vitamin D, lipoic acid, CoQ10, etc. The cure is bariatric surgery, metabolic surgery, or some other surgery.Type 2 diabetes cannot be cured with surgery! Type 2 diabetes is a biochemical and hormonal disease! Yes, you can reduce the effects of the disease with surgery, but, the diabetic's body is still in a diabetic state! Also, who's offering the cure? Doctors. Doctors can only offer 2 solutions: drugs and surgery. It's not their fault -- it's how they've been trained. If you are interested in a type 2 diabetes cure or treatment that your doctor or nurse has not mentioned to you, do your research first. Find a program that explains the program and allows you to use the program before you have to buy the book or the program. On the other hand, Mr. McCulley knows that his program will work. That's why he provides his program on his website free of charge. He knows that you will return to buy the book after you verify that the program works for you. So, do you know of any diabetes program where you can try the program for free without having to buy the book or ebook? After you try the program for free, watch the author speak at a medical conference about his recovery and ask yourself this question: Does this sound like someone I can trust? If you have questions, call us and talk with us or the author to get your questions answered! So, become a victor of knowledge & wellness, and stop being a victim of ignorance & illness -- it's all up to you. Your Doctor May Be Lying to You! When I was growing up, my parents taught us to respect the doctor (along with the preacher, the teacher, the policeman, and the librarian). However, during my recovery, my endocrinologist told me that I would have to stay on insulin for the rest of my life. And, I believed him because that's what I was told -- to believe and trust my doctor. But, when my health improved and my blood glucose and hemoglobin A1C started to go down, my endocrinologist told me that it wouldn't last and I needed to stay on the insulin. He told me that my good readings were an anomaly. Being an engineer, I decided to test the anomaly -- not because I didn't trust my doctor, but, because that's what we engineers do :-) -- we test, not guess. Needless to say, I was surprised by the data -- the data was indicating that my doctor may be wrong. So, I continued to test and gradually wean off the insulin (based on the data). I continued to test, because I expected my blood glucose would eventually go back up like the doctor said. But, my diabetes and my overall health continued to improved and my blood glucose and hemoglobin A1C continued to go down and eventually returned to the normal range! Once I had completely weaning off the insulin, my endocrinologist was angry and very upset with me. He warned me that I would be back on insulin within 3 months. Three months later, my blood glucose and hemoglobin A1C were still in the normal range. My endocrinologist told me to give it 3 more months. Three months later, my blood glucose and hemoglobin A1C readings were even better! But, my endocrinologist failed to show up at my appointment. Instead, he sent the physician assistant who told me that the doctor was upset with me because I was in denial of my diabetes. He refused to see me until I returned to taking the insulin shots. The physician assistant told me that the doctor said it's just a matter of time -- give it 3 more months, maybe 6 months before my blood glucose would return to the high levels. . Well, that was over 13 years ago! I never planned to go against my doctor -- I wasn't raised that way. But, I didn't expect the data to contradict what my doctor was telling me! It was very scary to go against the doctor, so I kept testing -- expecting the data to eventually support the doctor. In fact, I tested more frequently, because down deep in my soul, I believed the doctor. So, I waited and waited for the other shoe to drop -- for my blood glucose to begin going up, but it didn't! This is what other diabetics are faced with -- going against their doctor. It's not an easy thing to do. I was fortunate enough to understand the data and use it to my benefit and no longer require the use of any diabetic medications, including pills and insulin. Note: This experience with diabetes and my endocrinologist eventually led me to write my first book, Death to Diabetes. Later on, that led me to write several additional books, including books about juicing, heart disease, obesity, autoimmune disease and cancer. Who knew! ?